Innumerable times over the years students have come to ask the difference between JUTSU and DO, and for the most part my answers have always been to describe the basic surface distinctions—the historical, the philosophical, technical—the simple pragmatic basis of JUTSU as the basic military or soldierly training model, and DO, the modern pursuit of excellence and self actualization, the making of happier, healthier people and society and such. It is much deeper than that. On a most basic level JUTSU is the madness of violence and DO is the sanity of nonviolence. JUTSU is deeply and committedly a perspective of dualism—of self and other, of good and bad, of heroes and villains, of us and them. JUTSU promises empowerment through competence, technical and strategic skill and through superior firepower. JUTSU is all about winning and killing. This is basically kid’s stuff, the adolescent fantasy of the ultimate warrior who can conquer the world and make everything fit into the “big plan.” It is a natural extension of the mind that cannot but react to the karma of the circumstance except to try to steer it, control it, and force it. 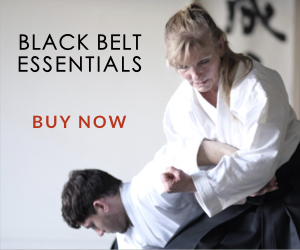 Make no mistake, JUTSU is a commonsense direct approach and it will solve some problems; it does have its good points, it has developed remarkable tools and techniques in the pursuit of its ends. But at the end of the day, since blood never successfully washes away blood, it is still madness. When we enter the path of training in the martial arts we all tend to start from just such a perspective (and notably, this is irrespective of what art you are pursuing and whether its name ends in the suffix “-jutsu” or “-do”). DO requires something different. DO will not bend to the will, will not be tamed into submission, will not become subservient to the ego, to the “self.” DO does not lend itself to self-aggrandizement (those who attempt to do such leave behind a wake of sad and humorous carnage in their lives. They reduce themselves to becoming caricatures of real seekers of the way—can you say Segal?) DO is a move past dualism into the nondual and back out the other side. It transcends and includes JUTSU. It is a complete liberation of self from self that compels us to work according to principles, to harmonize the activity of self to align with these principles and to follow where they lead. DO is not, and can never be attained or mastered. DO is rather what we surrender to, once we have gotten still enough and quiet enough to pay attention to reality. Through DO we can come to understand and embody principles such as AIKI and JU. JU is a principle that is strongly enmeshed in the dualistic world, it defines moments of opportunity as it joins centers together and it creates powerful responsive sensitivity. JU stirs up and reacts like an intense dance between yin and yang—like cats thrown in bag together—JU compels us to face and embrace conflict and to find and refine the tools of the dualistic dance. It is a sort of edgy, yang, a compassion that always pushes you just past your comfort zone. AIKI is the nondual response—when violence comes you do not choose to participate in making it more violent , but rather more harmonious. (This sounds far out but please note: this response is not escapist or denial oriented. With AIKI you become very intensely present and centered with what is occurring and you choose to help it along towards its logical end). 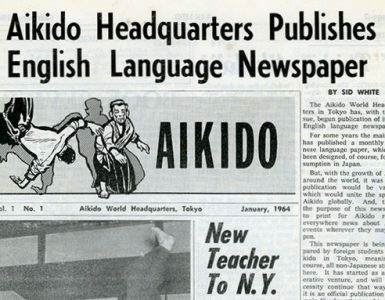 AIKI is counter intuitive and basically nonviolent, you don’t even really fight with AIKI. You don’t hit the guy; you let principle, reality, the universe, the planet itself hit the guy. When AIKI is really operating you become a freely flowing fluid agent of the attacker’s own karma. In AIKI , your nondual centered and embodied selfless quality just accelerates the unfolding of that karma. 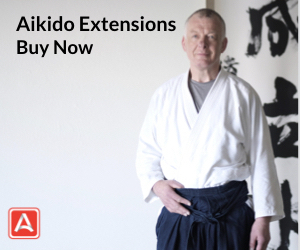 AIKI makes us all one family and ends the conflict decisively. 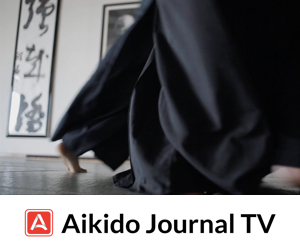 How do we realize the true nature of JUTSU, of AIKI, of JU ,of DO, and in the process, of ourselves? If common sense were right, if what we commonly perceive and believe were correct, if our sense of self and separateness were right, if our shared dualistic delusion were correct, then life would “work.” We would be able to act from this place of “self” and the actions would get us the results we wanted. It would be peachy keen in such a world, but unfortunately in so many many ways, both obvious and subtle, the evidence is in that life does not work when we pursue it in this way, from this basis, with this agenda. Sometimes to make progress we must go backward—against the grain, against the current. Here the turning around, and stepping back is required, for we must go into the unthinkable possibility of “forgetting the self,”—not killing the self, or destroying the ego. No extra adversarial foolishness is required; you don’t need to just get in yet another fight with yourself, nothing so violent is called for. This move is rather to see through or past, to committedly involve yourself so deeply in the moment that you cease to remain central to the picture. In the sense of “forgetting,” this is to relax into a different view in which the “self” simply fades into the background as we turn toward the view that actually realizes/embodies what is at the heart of DO and JU and AIKI, what they really are. For to wake up to what is true requires a move away from what is obvious and simple and toward what is deep and clear. In other words, if you seek the profound; you must become the profound. You must abandon opinions and knowing as it commonly habitually held and allow for an opening to occur through which will pass the animal of true nature, of direct knowing, as it is. This is not the dream of empowerment that we aspire to when we begin to seek the way; it is the far greater empowerment than we can imagine. It is our own awakened mind. The amusing thing about all this is… there is a developmental divide that makes seeing Do (as you discuss it) impossible from a level where skillful Jutsu seems like it is Do. 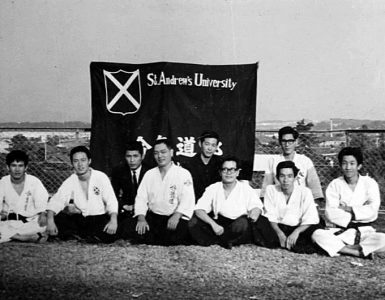 So those practicing Jutsu, technique, relative-mind subtle conflict, most often think that they are really doing aikido. Even very experienced and athleticly smooth Dans are often still practicing in a dualistic manner, with highly sophisticated skilled conflict, while perhaps talking poetically about harmony and oneness. It seems to me that without a serious meditative practice, with access to a masterful-nondual teacher, in additional to regular practice on the mat, it is extremely unlikely that the practitioner will have access to and experience the true oneness of aiki with any consistency. But we so often fool ourselves that we do. Thanks for speaking up for the true and rare nature of aiki and Do. I like what you’ve said. I have problems with students who get into this sense of one versus the other too soon. No amount of internal beliefs in magical powers changes that we are a collection of muscles, bones and neural fibers. 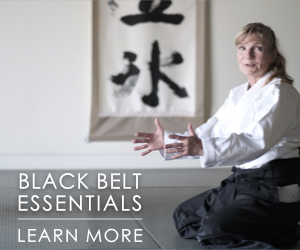 The Jutsu approach will talk about how to use physical structure and intention effectively. I see students who reject the apparent “violence” of the Jutsu approach (throwing out the baby with the bath water) who after years of training are starting to develop back and shoulder injuries. They don’t have the structure that could keep them issuing and receiving safely. The martial spirit is discarded, as it feels violent. The result is a situation I ran into the other day – a young woman started to yell for help on our ward, and I beat several people to the situation who were much closer. I am NOT a fast runner. I wasn’t conflicted about getting there, or having to act. I had no doubts or fears. Most of our Aikido techniques won’t work with a broken or inward spirit. Virtually no technique in life will! You are very clear you see “Do” as not in conflict with “Do-ing.” Many people can miss this point, and take their misunderstanding of “Do” as an excuse to never push themselves forward. Years ago during a Nidan test, a young man took poor ukemi from a poor throw and got a concussion. What I took away was the man in the audience who was rumoured to be the most violent in the association was the man who yelled at Sensei and stopped the test first. “Better” people in the audience never made a sound or an effort to assist though the injury was very apparent. His developed awareness and shear guts (who out there would yell at a Shihan to stop a test?) kept this young man safe when “better people” didn’t. Final thought: I had a student a few months back tell me he’d heard all you need to do to defuse violence is to smile at someone. I smiled at him while thinking “I’m going to make you die screaming and enjoy it” and he got my point immediately. Good versus Evil and Spiritual versus Martial don’t start externally in my opinion. Harmony is not about what I do with my fingers or how many teeth I show or the shape of my mouth and eyes. It’s my spirit and my intention. My Aikido techniques are vehicles for peace because I want peace. Or, I don’t hurt those I need to control because I make a fully informed choice (I followed both paths.) I know how to avoid causing injury because I fully know how to cause injury. The path to a better world is not ignorance. I’ve seen too many students who hate themselves as soon as they are really tested because they are afraid of what comes out. This art should help get them in touch with their true selves and help them become complete people. Students who try to only run in one direction or who try to pretend that what they don’t like doesn’t exist can’t go beyond duality in anything – they can’t even face the duality in themselves. The focus on the “two paths” leaves an opening for judgement, prejudice and disconnection. It forms the barrier against what you very eloquently described above. Sorry for the tirade. I liked what you had to say. Nick , you have a wonderful way with words. regards Bruce. Hear, hear! Masterfully articulated and needing to be heard. When you get to that still point in the center of that attack you can effortlessly re-direct it. So I like to describe Aikido as a kind of “instant Karma” because if somebody is angry with you and throws an attack at you, you simply get out of the way, re-direct it and they end up hitting the ground pretty hard. But you really haven’t done very much, you haven’t blocked or counter-attacked, you are just taking them where they wanted to go, or at least where they wanted you to go. So it’s a beautiful art and a beautiful analogy for how to use your mind on the physical plane. We also talk about using the principles of Aikido, non-resistance in emotional conflicts, personal conflicts, verbal conflicts. The key is acceptance. And acceptance is forgiveness.